Table of Contents Next: Edelsten, John H.
The Battle of the Eastern Solomons took place on 23-25 August 1942, early in the Guadalcanal campaign. The Japanese planned an operation, KA-Go, to simultaneously land reinforcements from Rabaul on Guadalcanal and draw out and annihilate the American carrier strength in the South Pacific. However, American code breakers had determined by 22 August that the Japanese carriers Zuikaku and Shokaku had moved to Truk and that a major battle was imminent. Fletcher moved his carriers (Saratoga, Enterprise, and Wasp) north to ambush the Japanese. By 23 August the Japanese forces were on the move. Tanaka commanded the transport force that was to land the reinforcements on Guadalcanal, and at dawn he was 300 miles (500 km) north of Guadalcanal. Nagumo was another two hundred miles (300 km) north of Tanaka and was moving southeast with the carriers of his Striking Force just behind a Vanguard Force (Abe) of two battleships and three heavy cruisers. Nagumo planned to stay out of range of Efate (he did not know American PBY Catalinas were operating out of Ndeni) and take up a position 250 miles (400 km) northeast of Henderson Field by dawn on 24 August. From here his carriers could seek out and destroy their American counterparts south of San Cristobal. Kondo was in command of a Support Force of six cruisers and a seaplane carrier sailing well in advance of the main group and responsible for protecting Nagumo's east flank. If Tsukahara's land-based aircraft failed to put Henderson Field out of business, then Nagumo planned to detach a Diversionary Group with the small carrier Ryujo to strike at Henderson Field on 24 August and clear the way for Tanaka's convoy. Fletcher positioned his force east of Malaita, almost exactly in Nagumo's path, but a faulty intelligence summary for 23 August placed the Japanese carriers still at Truk, over a thousand miles (1600 km) away. Fletcher decided to take advantage of the supposed pause in the action to rotate his own carriers through his refueling rendezvous to the south, and he requested Ghormley to have tankers standing by. Fletcher had come to rely heavily on the code breakers, but the Japanese had recently changed their operational code and much of this vital intelligence source had dried up — a fact of which Fletcher may not have been aware at the time. Furthermore, Nagumo had expedited his movement, canceling a refueling rendezvous and moving south earlier than originally planned. Tanaka's transports were sighted by a patrol aircraft at 0950 on 23 August, and a second aircraft confirmed the sighting at 1154. Fletcher set course to close the range while scouting for any accompanying carriers. Saratoga finally launched a strike of 31 SBD Dauntlesses and 6 TBF Avengers at 1440, while the Marines at Henderson Field launched 9 SBDs, 1 TBF, and 13 F4F Wildcats at 1615. However, weather conditions were unfavorable, and Tanaka had reversed course when he knew he had been sighted. As a result, neither strike group found their targets, and the Saratoga aircraft were forced to land at Henderson Field at dusk. Meanwhile Fletcher received further faulty intelligence placing the Japanese carriers en route to Truk from Japan, as well as confirmation from Ghormley that three oilers were on the way to the refueling point, and he sent Noyes off with Wasp to refuel. Wasp would not return until the battle was practically over. In fact, Nagumo was just three hundred miles northwest and Kondo was even closer. The Japanese never located Fletcher on 23 August, and Yamamoto, learning that bad weather at Rabaul had prevented a strike against Henderson Field, ordered Nagumo to detach the Diversionary Force to attack Henderson and ordered Tanaka to delay his landings until 25 August. By dawn on 24 August Fletcher was again 90 miles (145 km) east of Malaita. The Japanese had resumed their advance, and 0600 Kondo was 360 miles (580 km) north of Fletcher and Nagumo was 120 miles (190 km) northwest of Kondo. Tanaka was 275 miles (440 km) north of Guadalcanal and Hara with Diversionary Force had separated from Nagumo two hours earlier and begun a high-speed run to strike at Guadalcanal. At 0905 a Catalina from Ndeni spotted the Ryujo force 250 miles (400 km) northwest of Fletcher, and at 0935 another PBY spotted Tanaka 260 miles (420 km) north of Guadalcanal and 300 miles (480 km) northwest of Fletcher. However, the PBYs just missed spotting Nagumo. Another PBY reported at 1030 that it was being attacked by A6M "Zeros", which suggested to Fletcher that there were other Japanese carriers in the area. By 1100, the Saratoga strike of the previous day had landed back on its carrier. As the aircraft were landing, Wildcat fighters from the combat air patrol destroyed an H8K "Emily" twenty miles from the task force, beyond visual range, in the first interception achieved by the Saratoga's fighter director using radar. At 1128 a second Catalina spotted the Ryujo. Fletcher was reluctant to commit his strikes, correctly believing that the Japanese would not attempt their big push with less than three carriers in support, and he ordered Enterprise to launch a large scout force. By 1229 Kinkaid had put 16 Dauntlesses and 7 Avengers into the air. In reserve was Saratoga's strike of 12 Wildcats, 30 Dauntlesses, and 8 Avengers, as well as an Enterprise strike, now reduced to 20 Wildcats, 13 Dauntlesses, and 7 Avengers. Nagumo was disturbed to encounter American flying boats so far north, and he ordered a new tactic developed after the Midway disaster put into effect. The Vanguard Force raced ahead in a scouting line intended to augment his search, warn of American scouts, and finish off anything crippled by Nagumo's air strikes. Nagumo also hoped the Vanguard Force would absorb some of the American strikes sent in his direction. 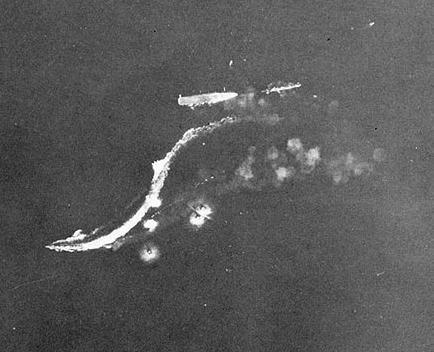 At noon Hara launched a strike from Ryujo of six B5N "Kates" and fifteen Zeros. These were intercepted by Marine fighters, which prevented the Japanese strike from inflicting any serious damage to the airbase. The Marines claimed to have shot down 21 aircraft, but actual losses were three Kates, three Zeros, and three Wildcats. At 1320 the Saratoga's SG radar detected Ryujo's strike headed for Henderson Field. However, this was enough to prompt Fletcher to launch a strike of 30 Dauntlesses and 8 Avengers against Ryujo at 1345. Fifteen minutes later one of Fletcher's scouts regained contact with Ryujo but misreported its position by over 100 miles (160 km). Fletcher attempted to redirect the Ryujo strike to the new position, but fortunately was unsuccessful. At about 1450, two Dauntlesses spotted Shokaku, evaded the Japanese combat air patrol, and scored two very near misses for minor damage. The flight leader sent out an accurate contact report, but communications were miserable and the position was too garbled to make out aboard the American carriers. Another Japanese patrol aircraft had been shot down near the American task force, and Fletcher had to assume his approximate location was now known to the enemy. Fletcher could do little but put up a heavy combat air patrol, clear his decks of strike aircraft, and wait. American search aircraft made unsuccessful attacks on Ryujo and Tone, losing a torpedo bomber to one of Ryujo's fighters. At 1550 the main strike found Ryujo and scored a torpedo hit and several very near bomb misses without taking any aircraft losses. Ablaze and without power, the light carrier was scuttled at 2000. Ryujo dead in the water after the American strike. National Archives #80-G-88029. Cropped by author. Nagumo had learned the location of the American carriers at 1400 from a float plane that evaded the American combat patrol long enough to make an accurate report. He launched his own strike in two waves totaling 54 D3A "Vals" and 24 Zeros. A third wave of 12 Zeros and 36 Kates stood by to be launched once the American fighter defenses had been beaten down. American radar spotted the first wave of Japanese at 1602 at a range of 88 miles, and Fletcher launched his remaining aircraft, bringing the combat air patrol up to an impressive 53 fighters. However, partial overcast provided cover for the Japanese, and the American fighter pilots still had much to learn about radio discipline. Returning scouts diverted some of the fighters until they were ordered to stay clear of the task force, and the radar contact with the Japanese strike proved erratic, fading away after the initial detection and not reappearing until 1619. The radar contact was confirmed visually at 1625 and the fighter directors attempted to vector the American fighters onto the Japanese strike. However, radio discipline was very poor, and at 1629 the Japanese strike broke up into several smaller groups, producing so confused a picture that the fighter directors lost control of the air battle. A group of 30 Vals evaded the combat air patrol and pressed home their attacks through intense antiaircraft fire, managing to hit Enterprise with three bombs at about 1641. 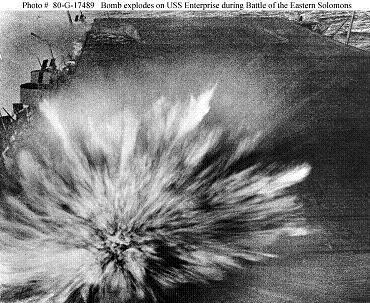 Two bombs did relatively little damage, but the third exploded in a 5" gun magazine and set off powder charges, wrecking the gun gallery and starting intense fires. The Japanese lost 25 aircraft from the strike, along with most of their crews, while the Americans lost six fighters, most of whose pilots were rescued. At 1655 the second wave of Nagumo's aircraft had been sighted headed straight for the damaged and vulnerable Enterprise. However, the Japanese planes veered to the south and missed the task force, though they were visible on radar to the west for several minutes. The Japanese planes eventually ran low on fuel and were forced to return to their carriers without making an attack. By 1749, when her planes began returning to Enterprise, she was could make 24 knots and was able to recover aircraft. Repair crews had plated over the holes in the flight deck and the fires were rapidly coming under control. However, the damage was more serious than it appeared. At 1821 local flooding shorted out a steering motor and jammed the rudder at 20 degrees right. Enterprise could not maneuver or even be towed. By 1859 the steering failure had been corrected and Enterprise was again able to maneuver. The Americans had cleared their flight decks of strike aircraft in anticipation of the Japanese attack, and these aircraft had become separated in the confusion of the air battle. Most milled about looking for a target until their fuel ran low and they were forced to return to their carriers, but one group of dive bombers ended up at Henderson Field. Five Avengers made an unsuccessful attack on Kondo's force, while at 1740 two Dauntlesses spotted Chitose and seriously damaged her. Boys, I'm going to get two dispatches tonight, one from Admiral Nimitz telling me what a wonderful job we did, and one from King saying "Why in hell didn't yo use your destroyers and make torpedo attacks?" and ... they'll both be right. Fletcher chose a wise course of action, as Kondo was heading south at flank speed to seek out the Americans. At midnight Kondo, running low on fuel, gave up and reversed course, joining the Japanese carriers well north of the Solomons where they refueled out of range of American strike aircraft. The next day, 25 August, found both carrier commanders reluctant to close with the enemy. Both forces were running low on fuel. Fletcher had lost only 17 aircraft, but Enterprise was wounded and not operating at full efficiency. Nagumo had suffered 25 percent losses to his air groups and was left with only 41 fighters and 59 carrier bombers. Ryujo was lost and Shokaku had taken slight damage. On the basis of grossly exaggerated claims by his pilots, Yamamoto claimed a major victory, but did nothing to prod his subordinates to pursue the supposedly beaten enemy. Ugaki, Yamamoto's chief of staff, rationalized that Ryujo had made a splendid decoy. Tanaka, who was under the mistaken belief that Henderson Field was out of action, pressed on to land his reinforcements on Guadalcanal. Ignored on 24 August during the carrier action, his force was picked up at 2105 by a radar-equipped Catalina. Henderson Field launched a strike of 8 Dauntlesses and 10 Wildcats before sunrise on 25 August, and Tanaka came under attack at 0935. Jintsu and Kinryu Maru were badly damaged. Mutsuki was sunk by B-17s from Espiritu Santo as she was rescuing survivors from Kinryu Maru: Even a B-17 could hit a stationary ship. The same attack damaged Uzuki, and Tanaka was ordered to retire to the Shortlands anchorage. Noyes launched a strike from extreme range at 1326, but his aircraft failed to make contact. Both sides handled their forces poorly. Fletcher had been hampered by faulty intelligence and miserable communications. Yamamoto had dispersed his forces and invited defeat in detail. The light carrier Ryujo was sunk in exchange for damage to the Enterprise, and Nagumo suffered serious attrition to his air groups. Yamamoto overestimated the damage he had done to the Americans and withdrew prematurely, exposing Tanaka's reinforcement convoy to air attack and forcing it to return to Rabaul. The outcome was a marginal American tactical and strategic victory. Detached for refueling and did not participate in the historical battle.